My daughter has really been into playing with CALICO CRITTERS lately. These are cute toy figurines of animals dressed up attractively in people's clothes. Each animal is made of a special flocked material that gives them an endearing quality and provides a fur like feel to the figurines' bodies. Plus there are accessories, buildings, and vehicles available to further enhance children's creative role play with these Critters as they put together families with moms and dads, grandparents, children and babies pretending to have them living in an imaginary Calico Village. Throughout this year my daughter has been using her allowance money to collect a rabbit family of Calico Critters. 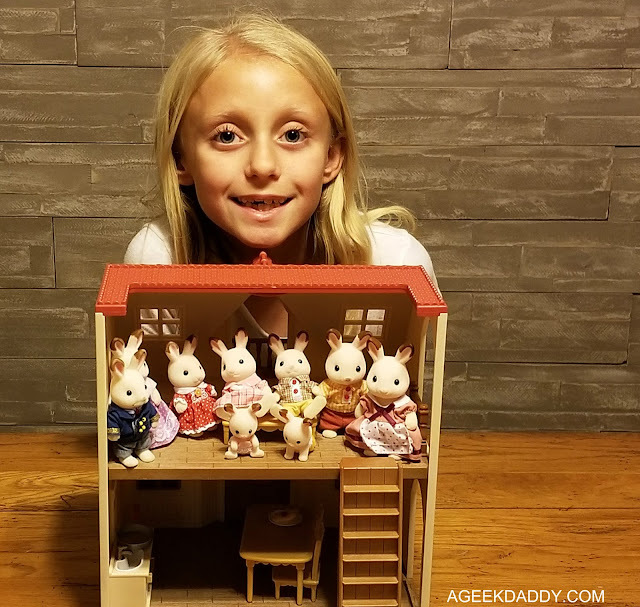 So to say she was excited is an understatement when EPOCH Everlasting Play sent ageekdaddy.com a playhouse for her collection of Calico Critters. It was fitting too that it included a girl rabbit figurine to go along with the other bunnies in my daughter's collection. The Red Roof Cozy Cottage is a nice starter home for those just starting out playing with Calico Critters. 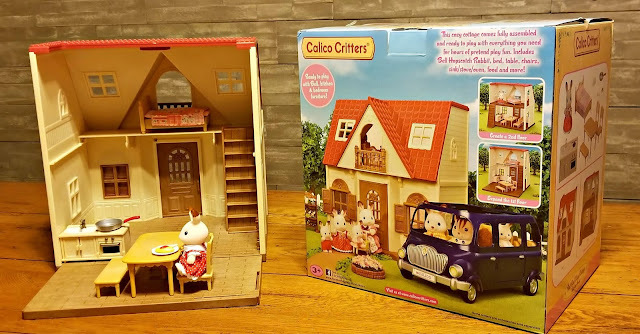 It includes a figurine and furniture accessories along with the cottage building making it a great stand alone playset, but also can be connected to a larger, three-story Red Roof Country Home (sold separately) to create a magnificent country manor for a Calico Critter family. The Cozy Cottage has everything a child needs by itself though to provide a child with hours of fun play as I've witnessed through all the time my daughter has been enjoying herself with it since she got her hands on this Calico Critters' playhouse. Plus parents will appreciate it comes fully assembled is ready to play with right out of the box. Red Roof Cozy Cottage has two floors with a staircase that can be moved around to a variety of spots around the playhouse layout. In addition to a front door, the cottage's windows have shutters that can be open and closed. The second story also has a removable floor that can be placed alongside the first level to provide a larger play space on the ground. These little touches make a big difference when it comes to enhancing the fun factor and expanding the play area of the Calico Critters Red Roof Cozy Cottage. 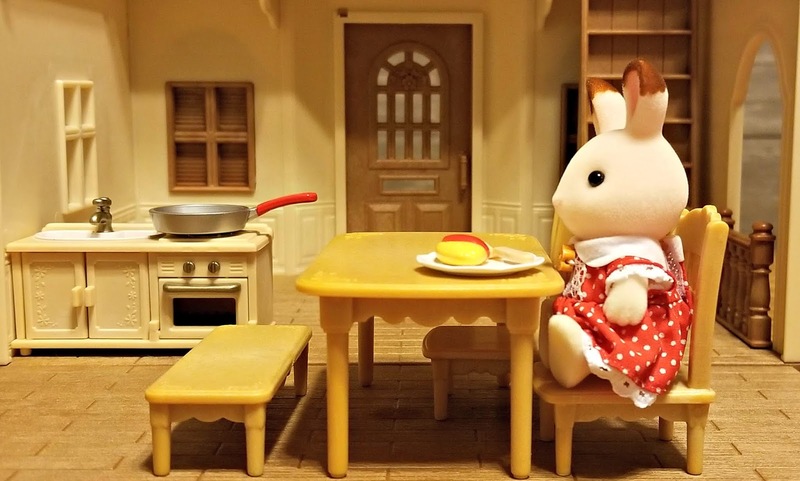 In addition to the playhouse and Bell, the Hopscotch Rabbit figurine, Red Roof Cozy Cottage also includes 12 accessories: a kitchen counter (with sink and oven), dining table, two chairs, bench, bed, mattress, quilt, frying pan, plate, fork, and an omelet. This is an all-in-one playset with this two story house. It is just fine to play with as is but also provides enough room for adding other Calico Critter furniture sets as well. Calico Critters Red Roof Cozy Cottage is an adorable playset that is sure to be enjoyed by kids as young as 3 and as old as in their tween aged years. 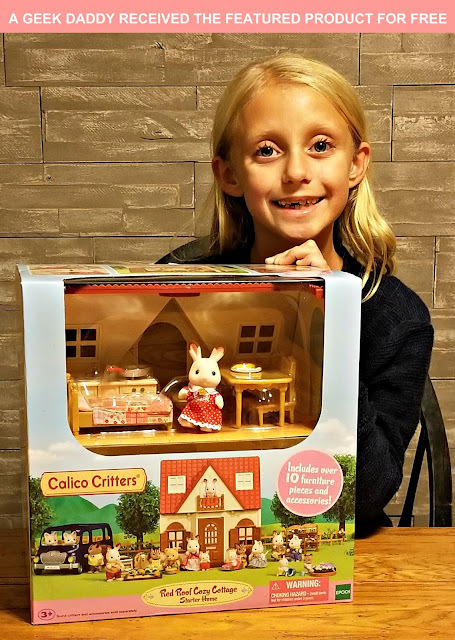 Calico Critters Red Roof Cozy Cottage has earned A Geek Daddy nod of approval because it has simply delighted my daughter. Based upon all the enjoyment it has provided her it absolutely gets a positive nod. She is so excited to have place for her Calico Critters rabbit family to call their own home now. For more information about these toys, hop over to calicocritters.com. 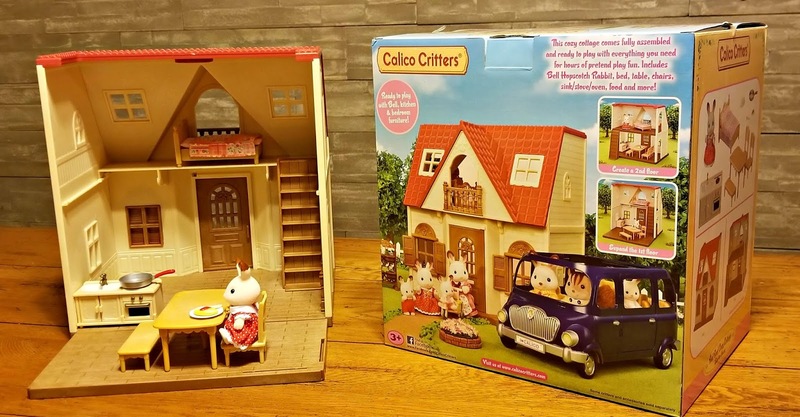 The Calico Critters Red Roof Cozy Cottage is available to purchase at retailers including Learning Express, Target and Walmart as well as from the EPOCH Everlasting Play website.